The fastest entry writing system in the industry. File with confidence knowing that SmartBorder ABI/ACE not only meets all the stringent requirements of U.S. Customs and Border Protection, but guides you through the process faster. We update often to reflect regulatory changes while refining functionality. Easy navigation and defaults help you quickly complete every entry. Three editions tailored to brokers and importers. 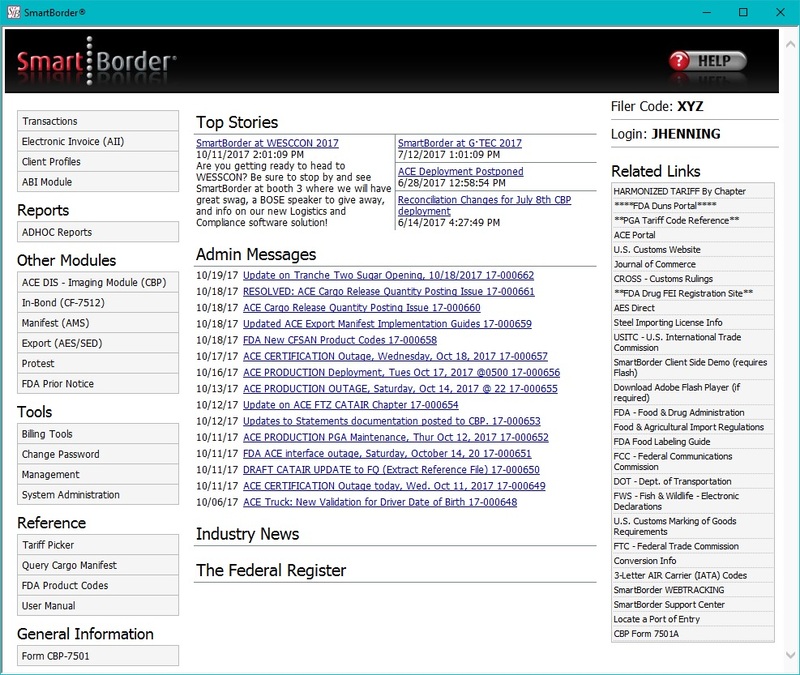 Whether you are a border broker, air/sea broker, or if you choose to self-file your shipments, SmartBorder’s ABI application has a specific edition for you. Fast, precise, and intuitive, our software adds authority and security to any broker’s service while guiding importers through the complexities of compliance. The fastest app of its kind, our Northern Border Edition enables your customers to contribute to their filing entries, saving further time. Whatever type of entry your customers require, our Air & Sea Broker Edition is flexibly configured to handle their needs. Self-filing requires careful entry. Our Importer Edition intuitively verifies data while making the clearance process as logical as possible. One application for all your entries and releases. The best software makes your job easier. SmartBorder ABI/ACE improves your service in multiple ways. Navigation is easier and faster. PGA filing is built in. Validation checks are automatic. Special program recommendations are automatic. And results come back faster after transmission to CBP. Find, view, print whatever you need fast. When you want information you’ve got it. 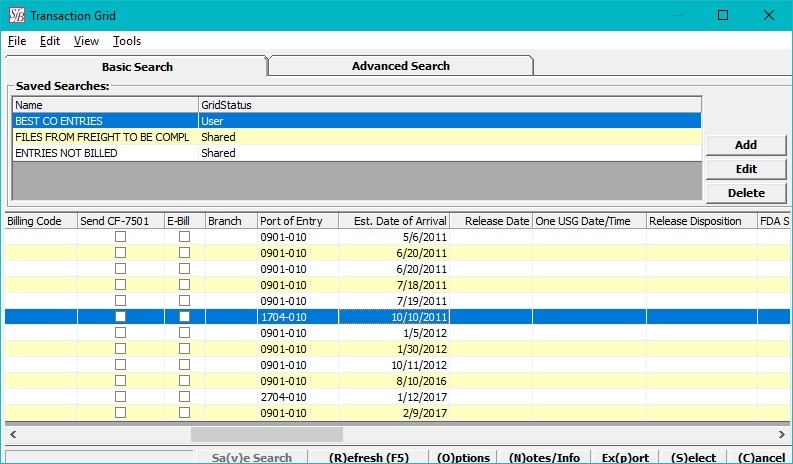 SmartBorder ABI/ACE is your window onto all filings across multiple transactions thanks to powerful search capabilities within our grids. Find any transaction via any field. View when an entry was released, who modified it, and more. Print or transmit your transactions in seconds. Store customer data with profiles. Store all customer information: notes, contacts, bond info, product lists, transaction parties, billing details, manufacturer IDs, and 5106s. Update CBP directly from the app. Store shippers and consignees for easy entry selection. Transmit and query the CF-5106. Automate manufacturer IDs for transmission. Easily export any list to Excel. Setup your staff and customers to receive automated email alerts for important events such a customs releases and prior notice. Keep everyone informed without having to open the transaction. Choose your fields and filters to generate your own reports, then export them to Microsoft Excel. File In-bond (7512)s in an easy to use module and take advantage of the copy transaction feature. Classify and view tariff number information such as duty rates, special programs, and applicable PGAs. The system is updated with the latest PGAs (such as FDA) filed right from the entry. Create and print delivery orders with prepopulated data from the transaction. Customize alerts and escalate entries that meet your requirements for additional review. Store all relevant product information including tariff numbers and PGA data to populate in the entry. Create single and continuous bonds for your clients as well as transmit eBonds. Upload line item tariff information directly from Microsoft Excel to your SmartBorder entry. Bill directly from the module. Manage automated clearinghouse statements and run queries such as the cargo manifest query.